Brookhaven National Laboratory chemists have designed a new ‘single-site’ catalyst that speeds up the rate of a key step in artificial photosynthesis. It’s the first to match the efficiency of the catalytic sites that drive this reaction in nature and could greatly improve the potential for making efficient solar-to-fuel conversion devices. 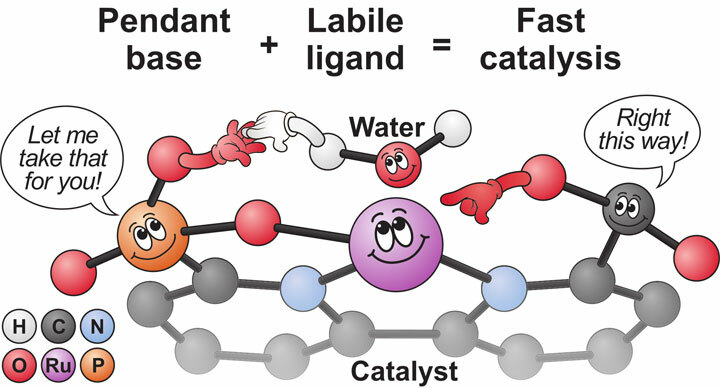 The new catalyst has a ruthenium (Ru) atom at its core, a “pendant” phosphonate group to act as a base that accepts protons (H+) from water, and a more flexible, or “labile,” carboxylate group that facilitates the interaction of the catalyst with water.. Image Credit: Brookhaven National Lab. Click image for the largest view. The chemistry is about an effort to mimic how plants, algae, and some bacteria harness sunlight to convert water and carbon dioxide into energy-rich fuels. This step, called water oxidation, releases protons and electrons from water molecules, producing oxygen as a byproduct. The catalyst acts as a chemical handler, shuffling around the water molecules’ assets – electrons, hydrogen ions (protons), and oxygen atoms – to get the reaction to happen. The improvement transformed a catalyst that created two or three oxygen molecules per second to one that produces more than 100 per second – with a corresponding increase in the production of protons and electrons that can be used to create hydrogen fuel. The next step is to test the new catalyst in devices incorporating electrodes and other components for converting the protons and electrons to hydrogen fuel – and then later, with light-absorbing compounds to provide energy to drive the whole reaction. This is quite the catalytic innovation with great promise. While still a lab build up, there does seem to be reason to think there ay be good prospects for this type of technology. There remains the issue of scaling up after producing hydrogen and solar powering. And out there still, is the matter of economics. But when the fossil fuel era winds down there looks to be great confidence building that there will be fuels for the future. Nice article! We can learn a lot from the article. Quite Informative page! Thanks for your sharing. I have learned a lot. The technology looks interesting. I like it. A lot of work is being done on photosynthesis and biofuel. Hydrogen is a difficult fuel to handle. The aim should be set at short chain spotless organic fuels. Such fuel with direct carbon fuel cells Could give a good continuity in renewable but intermittent power.